Who doesn't love a big bowl of cereal or a phat cupcake slathered in icing? Most def MEEEEE!! I've been a sugar and sweets addict since I was a little girl and although I've had many memorable nights in Italy scarfing cannolis and bakeries here in my hometown not sharing my cupcakes it's safe to say all that sugar and gluten and dairy got me into trouble. It wasn't until I was 30 years old that I ditched gluten and dairy and it wasn't until April of '18 that I also kicked sugar. It wasn't as hard as I thought it was going to be! I loved being lean, not bloated, sleeping better and having better periods. Sugar was causing a lot of issues for me and not only the kind found in cereals, cannolis and cupcakes, but also gluten-free pastas, potatoes and rice cakes. I've found a lot of freedom in my health since going keto and I love to share my passion for grain-free alternatives, especially desserts! Granola is one of those foods that can be seen as both health food and junk food depending on what's in it. I love this one because it's RICH in healthy fats, fibre and protein and void of sugar. I eat this as breakfast with unsweet almond milk or snack on it with strawberries and blueberries. If you're craving it with yogurt, try unsweet coconut yogurt! You can find it everywhere now, most grocery stores carry it. *side note* If you're suffering from chronic digestive upset I would avoid yogurts (or any fermented foods) until you get your gut health under control. These are just a few of the major triggers people experience. For more info reach out to me to book a call to talk about it further. Ok, let's get to the good stuff! If you make this be sure to tag me in your post, I'd love to see it! 1. Preheat oven to 250 F. Line a rimmed baking sheet with parchment paper. 2. 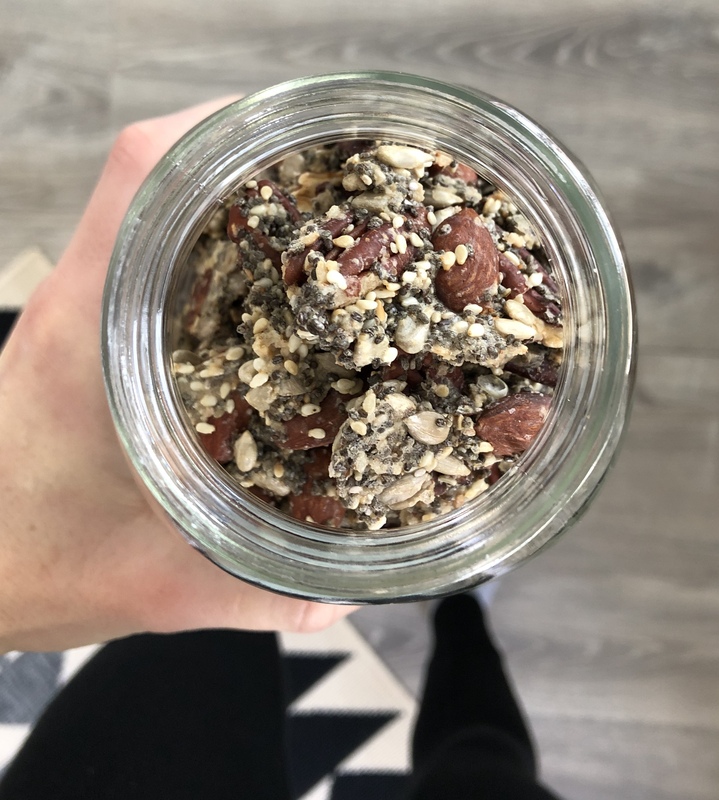 Mix almonds, pecans, sunflower seeds, pumpkin seeds, chia seeds and flax seeds in a large bowl. Set aside. 3. Lightly toast sesame seeds over medium/low heat for 4-6 minutes. Be careful not to burn them as they'll taste really bitter if so. They should have a light golden colour. 4. Add sesame seeds, sugar-free maple syrup and cinnamon to a food processor and pulse until powdered and mixed well. 5. Add sesame sugar to nut mix and combine well. Set aside. 6. Beat egg whites until soft peaks form. Gently fold into the granola mix until fully combined. 7. Spread granola onto the baking tray in a single layer and sprinkle with salt. Bake for 45-50 minutes or until they harden. Check every 15 mins or so. Allow to totally cool before eating as they crisp up really well when completely cool. OVernight is even better! 8. Break up into chunks and store in a glass container for up to a week. Store in the fridge and it'll last for 2!